Over the last few months the HWS Planning Group has been preoccupied with Wycombe District Council’s evolving Local Plan and the related Reserve Site Liaison Groups: attending meetings, analysing documents and collating views, culminating in the submission of our response to the draft Plan in early August. Local Plans are produced every 5-10 years but this one is particularly troublesome. The abolition of the South East regional planning process means that each authority now has to commission its own economic and housing forecasts in accordance with the guidance in the National Planning Policy Framework (NPPF), a slim document designed largely to mollify property developers, replacing generations of sound planning policy and guidance, and foisted on local authorities by central government. Central government policy envisages a rapid increase in house building – an aspiration shared by all major English political parties – and places the burden of finding space for all this building on local planning authorities. If authorities fail to make adequate provision, developers can pick the spots they favour based on their own commercial interests – regardless of local community and infrastructure needs – and their plans are likely to be approved by national planning inspectors over the heads of local authorities. Unpalatable though it is, the evolving Local Plan is an attempt to meet government demands on housing and other development, while protecting areas considered unsuitable. To this end, we have been forced to accept the principle of building on the long standing greenfield Reserve Sites, and of a review of the local Green Belt against the stated aims of Green Belt policy. With these issues effectively beyond our influence, we were generally impressed by the coherent approach WDC has taken in drafting the rest of the plan. We can only hope it is robust enough to protect what will be left of our countryside and discrete local communities for generations to come. Having said this, the “objectively assessed” housing needs figures upon which the entire Local Plan is based appear to be fundamentally flawed – an issue that needs to be addressed if the Plan is to be taken seriously. The Bucks Housing and Economic Needs Assessment (HEDNA) document, prepared by research company ORS and consultants Atkins, provides the statistical data upon which the draft Local Plan is based. As early as the end of last year we questioned why the Objectively Assessed Need for housing has been set so high – in particular why there appears to be a 20% “market signals” uplift that lacks robust justification – but have yet to receive a satisfactory response. 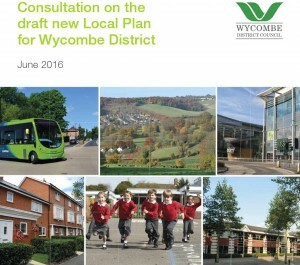 The effect of the uplift is that the draft Local Plan states that Wycombe District needs to accommodate 15,011 additional dwellings (from 2013) to 2033. We believe the correct figure should be 2,218 lower at 12,793. We consider it highly undesirable to allow the development of excess housing that will attract incomers from London and surrounding areas, putting additional strain on our already overstretched infrastructure and land resources. If the 2,218-dwelling uplift is found to be erroneous and removed, this in itself would be unlikely to affect the status of most greenfield sites currently proposed for development. The Plan envisages that Wycombe District will be unable to meet all of its housing need, with the rest potentially to be accommodated in Aylesbury Vale District: reducing housing numbers would serve chiefly to make negotiations with Aylesbury Vale easier. However, it might also allow for proposed development sites in the Area of Outstanding Natural Beauty (AONB) to be spared. We feel it is important that WDC does not proceed on the basis of a mistakenly inflated housing numbers assessment that may be used as a precedent and baseline in future similar planning exercises. In our Local Plan consultation response we went into some detail on this issue, and hope for a similarly non-trivial response. Our full consultation response covered a wide range of issues. Here are a few “highlights”. Protect, nurture and promote the historic fabric of High Wycombe’s town centre. a) Ensure listed building owners repair damage in a timely and appropriate manner, using penalties for enforcement if necessary. b) Council officers to visit “at risk” buildings and agree repair plans with owners. c) Develop a strategy for opening up ancient passageways wherever possible. Of course it’s not our job to write the words of WDC plans, but something like the above would be nice to see! The Reserve Sites are the subject of a separate process through Liaison Groups, so we refrained from commented further in the Local Plan consultation – with the exception of Gomm Valley & Ashwells. Recent proposals for this site envisage an increase in housing units to up to 640, and development extending almost the entire length of Gomm Valley to within a short distance of the Ashwells site. The increase in units is said to be because there will no longer be a requirement for outdoor sports on the site, but we do not accept that removal of this green space requirement should result in additional built development. We are concerned at the prospect of both damage to landscape character and destruction of the physical separation between High Wycombe and Tylers Green. WDC specifies an undeveloped break of approximately 170 metres between the Gomm Valley and Ashwells developments. While this may be considered sufficient to constitute a “nature corridor” – depending on what form of nature is expected to pass along it – it is insufficient to provide adequate visual separation between the two settlements. We have suggested that the required separation be increased to 500 metres to limit damage to the visual amenity of the area and to maintain substantial separation between High Wycombe and Tylers Green, as envisaged in earlier site proposals. We do not believe the Bassetsbury Allotments site is well suited to housing because of access issues and proximity to the Funges Meadow nature reserve. The residential designation conflicts with a proposal to establish a heritage centre and associated heritage trail, which has received support from the High Wycombe Town Committee. We support the heritage centre proposal in principle – particularly in view of the notable industrial history of the Wye corridor and the nearby Bronze Age settlement – and would like the Society to become involved. Any residential development to be kept well back from the boundary with Funges Meadow nature reserve, so that there is no visibility or disturbance of one from the other. We have objected to two proposals for major housing developments in the AONB, which also happen to be in the Green Belt. The NPPF requires great weight to be given to conserving landscape and scenic beauty in Areas of Outstanding Natural Beauty, and that planning permission should be refused for major developments, except in exceptional circumstances. The countryside within the Chilterns AONB is the greatest asset that Wycombe District possesses, and we would like every possible measure taken to safeguard it from development.